4) 1300+ hours playtime, 10000+ AP. 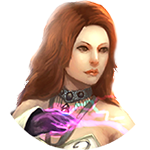 Favorites classes Ranger (sad with latest nerfs), Necromancer (glad with recent buffs). 5) Recently started Fractals, currently building AR and climbing to higher Fractals tiers for Ad Infinitum. Hello everyone! Is the guild still active in GW2? I've come back to the game after a couple of years of forced hiatus. Wondering if I should apply here! Yes we are! Just ping Moa ingame. He is usually very active.